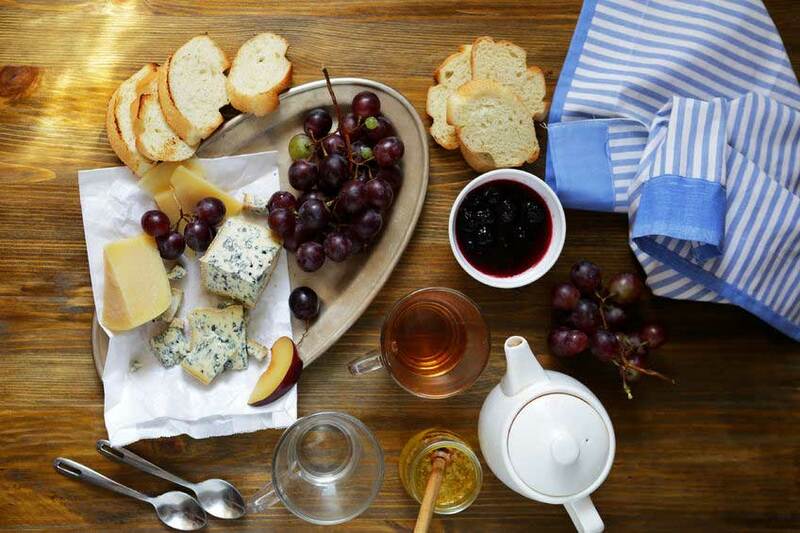 Pairing tea and cheese instead of wine and cheese is a new approach but makes perfect sense. In Asian countries where they traditionally do not add sugar to their tea, combining savory food rather than sweet with their cup of tea is quite normal. Historically tea and dairy have been served together for years by way of Devonshire teas, so the shift to pairing cheese and tea is not that big of a jump. Tea, like wine, has a great many varieties and flavors and the taste varies depending on the region it was grown in. Tea has more similarities with wine than it does with coffee. Tea, like wine, contains tannins which are dry and a little tart and the creaminess of cheese helps to balance these astringents in the palette. The heat in a cup of tea works to draw out the underlying flavors of cheese in a way that wine can’t do. As with wine and cheese, some thought needs to go into the pairings of tea and cheese for maximum taste. To get the most out of your tea and cheese ensure that tea does not steep too long otherwise it will become bitter. Ensure that the cheese is served at room temperature. As with wine tasting why not have a tea and cheese tasting. Start with the lighter and milder wines and cheeses first and then move to the stronger and heavier cheeses towards the end. Make sure you have some fresh fruit or bread to cleanse the palette after each tasting. To make the most of your tasting take a sip of tea, taste the cheese then follow with another sip of tea. Just like you would source quality cheese, make sure you also buy quality tea. Ensure the tea you buy is fresh and that it has been stored properly. Tea needs to be away from air and light. Try to purchase your tea from someone who specializes in tea and ask for their expert advice. White teas such as White Peony and Tribute Eyebrow have a delicate flavor and are sweeter and lighter in taste. These teas pair best with cheese which has a light texture and is also soft. Lighter cheeses are unlikely to overpower the subtle aroma of white teas. Examples of successful white tea and cheese pairing are ricotta and mozzarella. Adding a drizzle of honey or some sea salt will further bring out the flavors of the sweet white tea and round out the flavors of the cheese. Pairing green tea and cheddar bring out the grassy tastes in both the cheese and the teas. Green tea has enough tannins and astringency to hold their own with a strong cheese. The robust flavorings of green tea are perfect for the rich complex flavors of a nutty, cheddar. Sencha Green tea with its combination of unami and grassy flavors pairs well with goats cheese. Green tea also goes particularly well with a soft brie. Oolong teas can be very light and flowery, yet nutty and roasted. Depending on where the tea is grown you may taste honey, flowers, stone fruit, or milk, making oolong a flavorsome blend. Taiwanese Jin Xuan is a light tea that pairs well with Gouda’s milky sweetness. For the nuttier oolong blends try pairing a richer creamier cheese such as a brie. Black teas are versatile and can pair with a variety of cheeses. A blue cheese and a smoky black tea will set your taste buds alight with their smooth and elegant flavors. Darjeeling paired with brie can lessen the natural astringency of the tea. Black tea paired with a ripe cheddar also works particularly well, with the crisp taste of the cheddar bringing out the smoky flavors of the black tea. The malty flavor of puérh paired with an aged Gouda is a perfect combination. The earthy tea brings out the toffee flavors in the cheese creating a taste sensation in your mouth. When choosing teas for pairings, single origin teas are best so as not to confuse the palette. Single origin teas have their own unique characteristics and do not need to have added flavors. 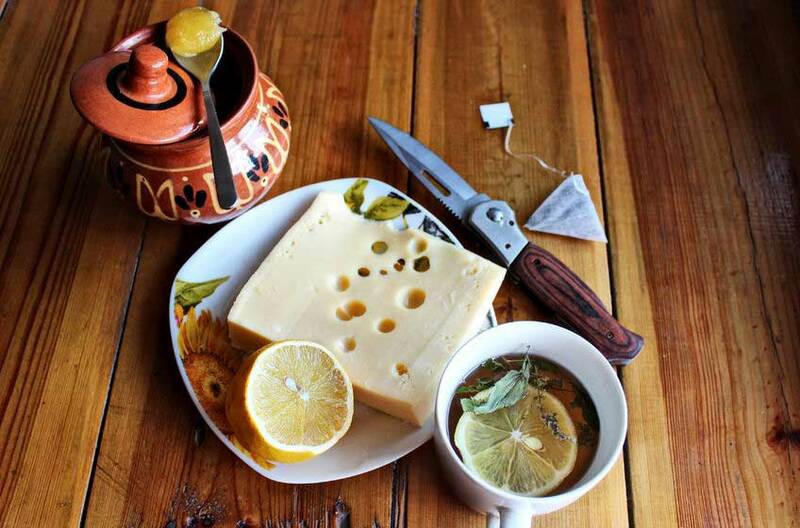 A successful pairing is when cheese and tea enhance rather than drown out each others flavors. Tea is used to compliment, contrast, and enhance the flavor of your favorite cheese. At the end of the meal, or for a refreshing afternoon tea alternative consider pairing your favorite blend of tea and cheese. What is your favourite pairing?